I have been taking advantage of the Regal Free Family Film Festival since my 10 1/2 year old son son was just 18 months old. It's something that I look forward to doing with my children each summer. It's a great way to spend the morning, one day a week. Even if it's a movie we have already seen, the kids LOVE going to the theater and watching it on the BIG screen! This year Regal Cinemas is offering something just a little bit different. Instead of being free, movies are going to be $1 each. Still a fantastic deal and one that my children and I are going to be taking full advantage of. It's first come, first served, so my advice is to get there about a half hour early. Also, bring a sweater, our theatre is a little chilly. Moviegoers of all ages can climb aboard to enjoy a great selection of films. During this 9-week festival, select Regal Cinemas, United Artists and Edwards Theatres will offer selected G or PG rated movies for only a dollar on Tuesdays and Wednesdays at 10:00am. 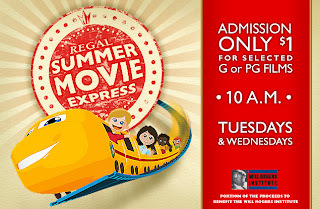 Learn more about the Regal Summer Movie Express and find a participating theatre near you!